Team Building is a constant in the corporate world. The reasons are simple, team building activities offer improved communication between team members, enhance team cohesiveness and they bond team members, which is broadly accepted to make teams work more efficiently and thus more profitably. But many people shy away from such experiences because it takes them out of their comfort zone by making them answer questions they don’t want to, solve puzzles or undertake exercise that show that their gym visits haven’t been quite as regular as their co-workers were meant to believe. Fear not, the cooking team building experience is gaining a reputation for maintaining the end result desired, whilst engaging staff in an interactive activity that is challenging and familiar. At VictorsFood, we are experiencing rapid growth – monthly bookings are up 42% because of the increasing popularity of our team building events like ‘MasterChef Challenge’ , ‘Cook Smart and Eat Well’ and ‘Raw Ingredients’ . With ‘Raw Ingredients’ organizations can expand their team building sessions with the aid of professional facilitation and psychometric profiles to further maximize team effectiveness. This culinary approach ticks all the boxes with team building and corporate wellness goals of many organizations. Significant cost savings associated with this approach to team building has attracted the attention of employers. A restaurant quality meal is included, naturally, as cooking or preparing the food is part of the team building experience, which means no lunch expense to factor in. Location is also most often tailored to suit, reducing travelling time and expenses. And, these events need not be time-consuming, we offer anything from 45 min to half day events, reducing time staff are taken away from their work. A major advantage in countries like Australia is that much of the training cost can be ‘written off’ to the training budget. Another bonus of cooking team building is that the meal is most likely Fringe Benefits Tax free. It’s clearly not hard to understand why this tri-fold benefit of cost savings, team development and corporate wellness is appealing to many organizations. After all, there will always be the requirement for staff to achieve greater efficiency and profitably by working better together, so team building is the most obvious of solutions. 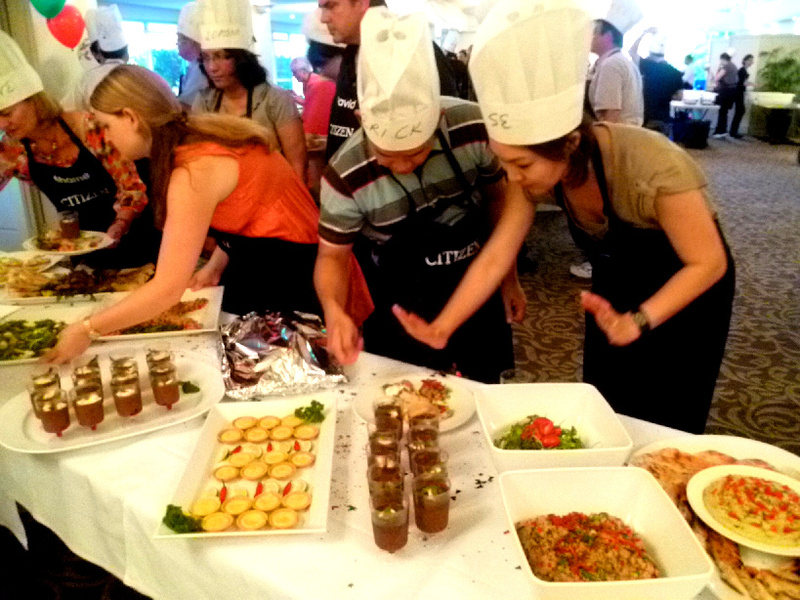 Representatives from Australian company VictorsFood, an experienced team building event organizer, have said that their monthly bookings are up 42% because of the increasing popularity of their team building events like ‘MasterChef Challenge’ , ‘Cook Smart and Eat Well’ and ‘Raw Ingredients’ . With their ‘Raw Ingredients’ organizations can expand their team building sessions with the aid of professional facilitation and psychometric profiles to further maximize team effectiveness. This culinary approach ticks all the boxes with team building and corporate wellness goals of many organizations. Significant cost savings associated with this approach to team building has attracted the attention of employers. A restaurant quality meal is included, naturally, as cooking or preparing the food is part of the team building experience, which means no lunch expense to factor in. Location is also most often tailored to suit, reducing travelling time and expenses. And, these events need not be time-consuming, experts like VictorsFood offer 45 min to half day events, reducing time staff are taken away from their work. A major advantage in countries like Australia is that much of the training cost can be ‘written off’ to the training budget and is most likely Fringe Benefits Tax free. need not be time-consuming, experts like VictorsFood offer 45 min to half day events, reducing time staff are taken away from their work. A major advantage in countries like Australia is that much of the training cost can be ‘written off’ to the training budget and is most likely Fringe Benefits Tax free.